Riskas began to grow discontent with initial change in clients that later backslid, which was true for himself too. He came to believe that our darker side has a “hidden agenda” that is “running the show (15).” Riskas left the Covey group to do inner work. (1) Today’s conventional wisdom lacks real appreciation for human limitations and the unconscious values and wisdom of the soul. (2) We lack sufficient consciousness, maturity, and wisdom to ensure balance, consistency, and true integrity. Often, we imitate the form of success without the interior substance to accompany it, including the shadow of success. (3) We have become so enamored with the false notion of perfection, and neurotic in our pursuit of it, that we have lost touch with our own darkness. (4) We lack the desire, or even the willingness, to face the truth and clear the past of our wounds, losses, and wrongdoings. What stops our growth and keeps us stuck in old patterns of self-defeating thinking and behavior? The answer to both is: wounding (psychological and spiritual) and the suffering that comes with it. Men tend to marry women like their mothers. Women tend to marry men like their fathers. These lies tend to be self-fulfilling prophecies, often spiraling downward from there. Reactive cycles often begin with negative judgments that form when unrealistic and/or uncommunicated expectations are violated (78). There’s always a way out. (4) Align our behavior with our values in order to respond more effectively to difficult, or “triggering,” situations. Apologies can go a long way. See moving story of author and his father (103-106). Self-knowledge requires integration of all these parts. (3) you show absence of good conscience evidenced by peace and quiet assurance or bad conscience evidenced by defensiveness, irritability, etc. Eating the shadow – whatever we hate or admire in others, we are. (1) What is it in someone else that is affecting us? Ask yourself what causes you to move from your positive pole to your negative pole? (1) Go through the dream and write out every association that you have for each dream image. (2) Connect each dream image to a specific dynamic in your inner life. (3) Interpret the dream – Ask: What is the central, most important message that this dream is trying to communicate to me? What is it advising me to do? What is the overall meaning of the dream for my life? (4) Do something physical to honor your dream – Don’t just keep it in your head. Perform some ritual. But use common sense and don’t act irresponsibly. (1) Choose an interpretation that shows you something you didn’t know. (2) Avoid the interpretation that inflates your ego or is self-congratulatory. (3) Avoid interpretations that shift responsibility away from yourself. (4) Learn to live with your dreams over time – fit them into the long-term flow of your life. If you can’t settle on an interpretation, live with it for a while. Some psychologists consider active imagination more effective than dream analysis for accessing the shadow. (2) Dialogging with and experiencing dream figures. (3) Adding the ethical element of values. (4) Making it concrete with physical ritual. Close your eyes. Clear mind of distractions. Enter into a dream that is unresolved that you remember. Quietly and patiently wait for some image to appear. Don’t attempt to control the image. If you sense the image feeling something, ask it about what you sense. It is good to record as you go. The image will wait. Sometimes, you’ve got to reframe what is emerging for you to do to be more ethical. Negotiate for an acceptable solution. Slips of the tongue and humor can reveal our shadows. Look for addressing someone with someone else’s name. Ask yourself what it means? Humor can reveal things that ring true for us even if we wouldn’t consciously identify with it (e.g., inappropriate jokes). Reactive episodes also can reveal our shadow – they tend to reveal wounds that are causing us psychic pain. Under what circumstances might the inconceivable become consciously conceivable to you? Think of a recent criticism someone has made of you. What character flaws associated with that criticism are you resistant to seriously consider? Countervalues are the values of one’s shadow. Under what conditions might harshness, disobedience, jealousy, hatred, and so forth be ethically justifiable? What might the consequences be in employing these countervalues? How might such values be employed in good faith? How might self-deception be involved and avoided in the decision-making process? Intellectual knowledge of your shadow isn’t enough. You’ve got to feel it. One way to do this is to sit and listen to one’s self in silence. Compassion towards self is critical to embracing the shadow. The more we resist shadow work, the more we need it. (1) Make a list of people you dislike, rank them. Write a line or two under each name of the qualities that repel you. (2) Read over your list, pausing and reflecting on the awful aspects of the listed people. Which aspect brings out the most sense of righteous outrage? (3) Reduce the people to their single most reprehensible trait. (4) Each of these personality traits represents one of your disowned traits. (5) Each disowned part has an opposite energy that is part of your ego. (6) Talk to your disowned part directly. Star Wars analogy integrating darkness and light continues on 165-166. How are you seeing this? Why are you seeing it this way? What are some other ways of seeing it? What information are you missing to make a more accurate judgment? What are you inclined to do and what might happen if you do? For each item in the stressful list, determine what strengths you employ in dealing with them and what corresponding negative shadows emerge as well. Determine how to ethically deal with the situation harnessing strengths and avoiding the extremes of shadow. Sometimes we run into a collision of genuine morality/duty and what our deepest self seems to be calling us to do. (1) What concerns (physical, emotional, or spiritual) am I experiencing right now that concern or distract me? (2) What is my soul trying to communicate through these symptoms or conditions? Try using active imagination (see above) to communicate with conditions. (3) How can I best respond to the call or complaint of my soul? There are “hidden wedges” in our lives that prevent natural growth from occurring. Sometimes asking for forgiveness is the answer. It is impossible to forgive others when we are playing the victim role. (2) Select one of your triggering events that has emotional energy behind it and allow your memory to produce an actual situation. (3) Begin the confrontational conversation with the imaginary other in the chair across from you. (4) Substitute the person in the chair with one of your parents. Modify the context to better fit home life. (5) Demand an explanation from the parent by questioning their behavior. Then switch chairs to the role of the parent and tell the child why you did what you did. Then move back to the child’s chair and respond. (6) Make demands of your parent. Tell them what you want and don’t want. (7) Remaining in the child chair, imagine yourself in the parent chair and make the same demands of yourself as the internalized parent. Repeat until you believe it. (8) Sit in the parent’s chair and identify with the wounded child, considering his or her feelings. Ask for forgiveness. Don’t actually confront your parents. This exercise is about internalized parents. We must also work to heal the loss of close family members. There is a “mystery” that happens when personal change occurs. It can’t be explained. Moving “The Story of Joe” on pages 202-206. Moving story of Teddy Stallard and teacher Jean Thompson on pages 206-208. Think in polarities, by which Riskas means nonpolarized thinking (which is ironic). This allows us to see the complexity of humanity within others and ourselves, e.g., obedience that brings freedom, weaknesses that reveal our strengths. True moral dilemmas force us to stand alone in the moral tension. It isn’t enough to feel that you’re right. You must feel compelled to do something by a higher voice from within. We must learn to recognize the unique voices of our own internal assent in order to understand them fully. These voices can include wholeheartedness, rationalization, restraint, hesitancy, and more. 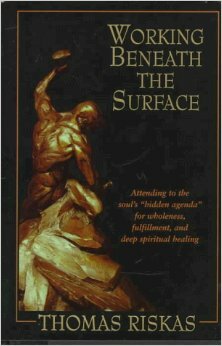 Working below the surface enables us to practice nonattachment in the face of unconscious extremes.